Are you actually looking for ladies dance shoes? Well, we hope you are because the reality is that you have found our page on the subject. 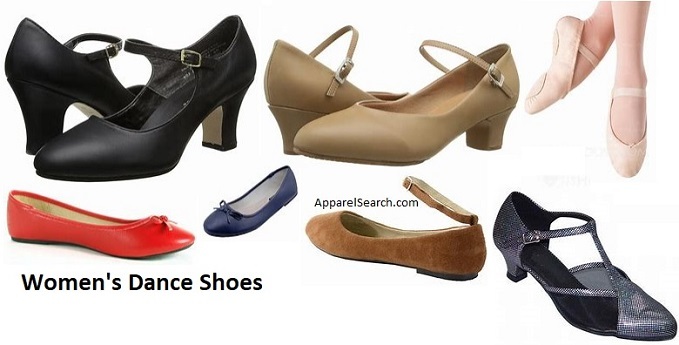 In this women's clothing section of the Apparel Search directory, you will find all sorts of interesting information regarding dance shoes for women. Welcome to the worlds greatest guide to women's dance shoes. A shoe is an item of footwear intended to protect and comfort the human foot while the wearer is doing various activities. One such activity would be dance. Technically, dancing can be done in any type of footwear from sneakers to high heels or flip flops. However, specific types of dance require specific types of footwear. For example, tap dancing requires tap shoes and ballet is best done in ballet shoes. Here are a few of the various types of women's dance shoes to consider. Ballet is a type of performance dance that originated during the Italian Renaissance in the 15th century and later developed into a concert dance form in France and Russia. It has since become a widespread, highly technical form of dance with its own vocabulary based on French terminology. It has been globally influential and has defined the foundational techniques used in many other dance genres and cultures. A pointe shoe is a type of shoe worn by ballet dancers when performing pointe work. Pointe shoes were conceived in response to the desire for dancers to appear weightless and sylph-like and have evolved to enable dancers to dance en pointe (on the tips of their toes) for extended periods of time. They are manufactured in a variety of colors, most commonly in shades of light pink. Every dancer has unique feet, with variations that include toe length and shape, arch flexibility, and mechanical strength. Consequently, most pointe shoe manufacturers produce more than one model of shoe, with each model offering a different fit, as well as custom fitted shoes. All pointe shoes share two important structural features that enable dancers to dance on the tips of their toes. They have a "box" and a "shank". The exterior of a pointe shoe is covered with fabric, thus concealing the box and other internal structural elements and lending an aesthetically pleasing look to the shoe. Most pointe shoes are covered with satin, but some are available with canvas exteriors. For most pointe shoes, the sole is constructed from a piece of leather that is attached to the shoe with adhesive and reinforced by stitching along its edges. The sole overlaps and secures the unfinished edges of the shoe's exterior fabric. A pointe shoe employs two fabric ribbons and an elastic band to secure it to the foot. Most of the work of securing shoes to feet is done by the ribbons. The two ribbons wrap around the dancer's ankle in opposite directions, overlapping one another so as to form a cross at the front. The ends are then tied together in a knot, which is then tucked under the ribbon on the inside of the ankle to hide it from view. The elastic band—which traverses the front of the ankle below the ribbons—keeps the heel of the shoe in place against the foot when the dancer is en pointe. More about the box and shank of a ballet shoe. A box within the front end of the shoe that encases and supports the dancer's toes. A shank, which is a piece of rigid material that serves to stiffen the sole so as to provide support for the arch of the en pointe foot. A shank's thickness may be consistent throughout or it may vary along its length to produce different strengths at select points. For example, slits may be cut across a shank at demi-pointe to enhance roll through. Also, a shank's thickness may transition at some point along its length in order to implement differing strengths above and below the transition. Standard pointe shoes typically have a full shank, in which the shank runs the full length of the sole, or fractional (e.g., half or three-quarter) length shanks. Shanks are typically made from leather, plastic, cardstock, or layers of glue-hardened burlap. Dancers typically "break in" new pointe shoes to reduce or eliminate the discomfort they commonly cause, usually by performing relevés and eleves that flex, and thus soften, the boxes and shanks in a natural manner. The élevé and the relevé sound very familiar but they are executed differently from a technical perspective. Relevé : Abbreviation of battement relevé lent. Term from the Russian school indicating raising the leg slowly from pointe tendue to 45 degrees or higher off the ground. The word élevé comes from the French verb elever, which means "to bring up" or "to rear." This word has a slightly different connotation in the French language as well as a slightly different technical approach in ballet. When a dancer goes on élevé, the dancer is also rising to the balls of the feet, or all the way up to full pointe, from flat feet. However, in élevé the dancer is not rising to the balls of the feet from a plié or a demi-plié. Instead, the dancer goes straight up with a straight leg that has no bend. An easy way to remember the difference between an élevé and a relevé is to remember that an élevé is similar to an elevator: It goes straight up. Foot thongs are slip-on, partial foot covers that cover the ball of the dancer's foot so as to reduce friction while executing turns, thus making it easier to perform turns and also protecting the foot from skin abrasions. From a distance, flesh colored foot thongs give a dancer the appearance of having bare feet. Tap dance is a form of dance characterized by using the sounds of tap shoes striking the floor as a form of percussion. The sound is made by shoes that have a metal "tap" on the heel and toe. There are different brands of shoes which sometimes differ in the way they sound. "Soft-shoe" is a rhythm form of tap dancing that does not require special shoes, and though rhythm is generated by tapping of the feet, it also uses sliding of the feet (even sometimes using scattered sand on the stage to enhance the sound of sliding feet) more often than modern rhythm tap. In the earliest years of tap dancing, tap shoes often had wooden soles, but most tap shoes since have had leather soles. There are a variety of styles of shoe, the Oxford shoe being very common in jazz dance, and Mary Jane (shoe) is common for younger girls in tap classes. Metallic taps were added to tap shoes in the early 1900's. Taps are mounted to the sole of the shoe with screws, and sometimes adhesive as well. The screws are driven into a soundboard – a thin fiberboard integrated into the sole that can be firmly "gripped" by the screws – to reliably attach the tap to the shoe. When no adhesive is used, the screws can be loosened or tightened to produce different sounds, whereas tonal quality is fixed when adhesive is used. Ghillies are specially designed shoes used for several types of dance. They are soft shoes, similar to ballet shoes. Ghillies are also sometimes known by a variety of other names that include: light shoes, pomps, pumps, and soft shoes. A jazz shoe is a type of shoe worn by dancers. They are used in jazz dance and other styles of dance including acro dance, acrobatic rock'n'roll, and hip hop, and in other activities, such as aerobics. Jazz shoes are available in a variety of styles, with varying features. They may be high-rise or low-rise, and may be slip-ons or lace-up Oxfords. Split-sole jazz shoes allow enhance shoe flexibility, making it possible to flex the foot more easily. Most have rubber soles, which provide traction and also help to cushion the foot, and some have thicker heels for better shock-absorption. A flamenco shoe is a type of shoe worn by flamenco dancers. They are typically worn by female dancers, they are called flamenco heel, often with traje de flamenca costumes. Flamenco shoes constructed for dance generally have small nails embedded in the toe and heel to enhance the sound of the dancer's percussive footwork. The most common materials are leather and suede, although synthetic materials are also used in certain grades of shoes. Heel types can include "standard", "carrete" (curved), or "cubano" (short and thick) with a heel size generally ranging from 4 cm to 7 cm. Heels are often covered by the main material but may also be exposed wood. Fastenings may include elastic or leather straps, buckles, or laces. Above are only a few of the various types of dance footwear for women. Apparel Search is a leading guide to fashion, style, clothing, glam and all things relevant to apparel. We hope that you find this women's dance shoe page to be helpful. What ever type of shoe you are wearing is in style. If you want to be even more stylish, you should wear your favorite dance footwear.